Aranos (pronounced aranyosh) was born in Bohemia (now a part of Czech Republic). He has performed as a singer and instrumentalist since the age of 8 in folk ensembles, jazz bands, rock groups, gypsy bands, ceilidh bands and as a solo artist. Written and composed in various styles from classical music to rock. He has performed and composed in dissident theatres in former Czechoslovakia. Aranos sings and plays violin, viola, cello, bass, guitar, mandolin, piano, keyboards, banjo, Chinese and Japanese flutes, santoor, drums, percussion, etc. Aranos has recorded Traditional Irish, East European, gypsy and folk albums and CDs. Recently concentrating on experimental electroacoustic music mostly recorded in his own 24 track recording studio and released in Great Britain and France. Aranos has written soundtracks to videos and films as well as theatre e.g. Spell of the Megamall - a multimedia production with Theatre Omnibus and Disabled People of Clare, "Spirit" - an experimental electroacoustic tone poem mini opera in collaboration with a renown writer and poet Max Hafler. 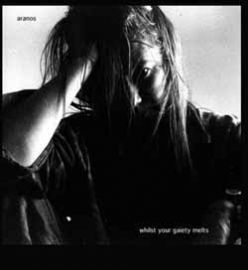 Aranos collaborates on a regular basis with Steven Stapleton of Nurse With Wound and David Tibet of Current 93. 'Sunset Beaches Crumble' begins with rhythmic piano and violin and mixed effects which slowly morphs into very long and sweet violin drones with haunting deep, subtle vocals. Somewhat in the vein of minimalist composer Tony Conrad and his violin drones. A mix of Eastern Europen folk music with avant-garde techniques. 'Octopus Field' is a more low-fi, free flowing soundscape with layers of minimal organic sounds and effects. Very opposite sounding to 'Sunset Beaches Crumble.' The song borders on ambient with a hint of electroacoustic stylings mixed into it. The Wire Sept. 2001 wrote "...a kind of weepy folk base to build slowly evolving mounds of tension, and the vocals, which appear sparingly, sound like they emanate from an old man who lives in your mattress. The two pieces here focus on Aranos' violin, his primary instrument. The record would make a charming addition to any decent collection."